Custom manufactured vintage style Keystone frame. Complete .120” wall DOM steel tube construction. 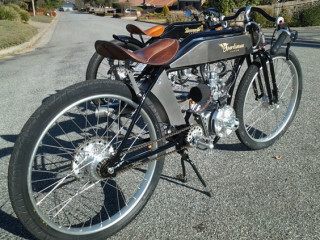 Exclusive Sportsman vintage style double reduction drive system. Designed to carry the powerful Sportsman Flyer motorcycle engines from 100cc up to 250cc. Vintage style internal spring forks with rebound damping. H speed rated motorcycle tires. Completely redesigned front suspension to carry speed rated motorcycle tires and wheels. 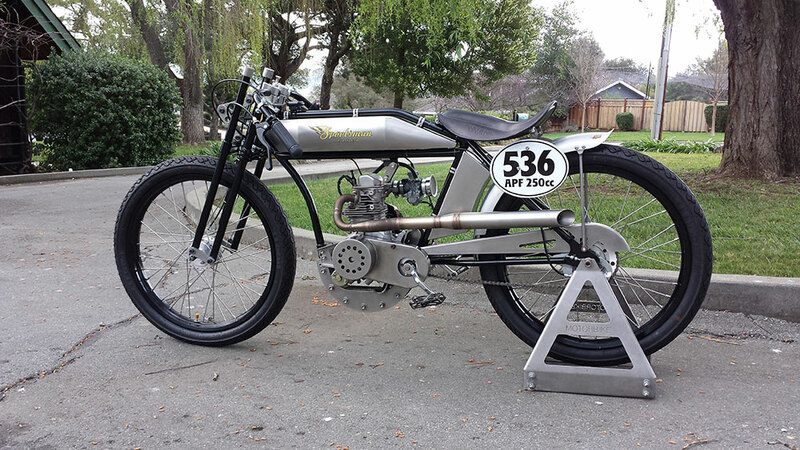 The Keystone Flyer is a factory works racer based on a modified Bonneville chassis. 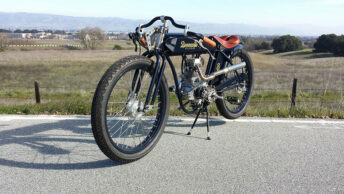 Keystone style frames were developed by Harley and Indian and first appeared at the “Keystone” wooden board track. The drop loop part of street motorcycle frames were removed so the engine could be lowered and moved forward in the chassis. This also allowed faster engine changes. Sportsman Flyer has made the same modification with the same results. 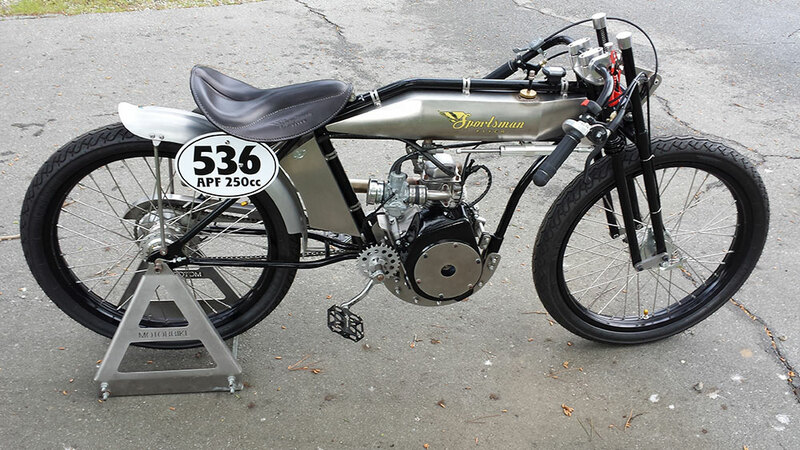 Engine subframes are available for various Sportsman Flyer motorcycle engines. All engines are extensively modified throughout. The Keystone Flyer is available on a very limited basis. 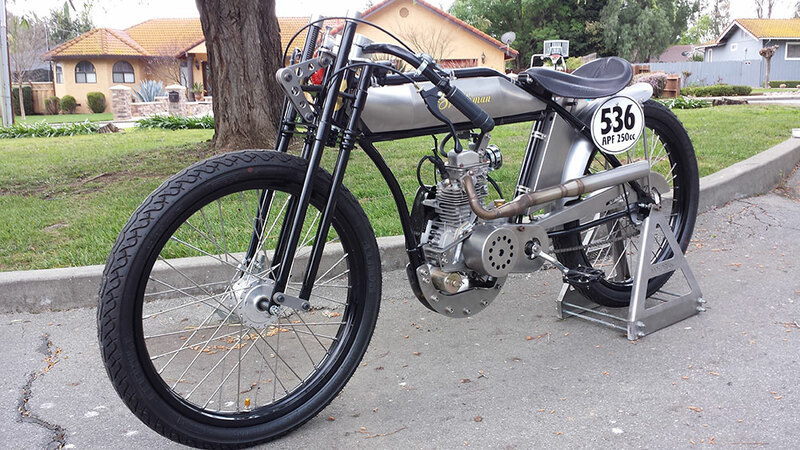 It is certified to run in SCTA sanctioned motorcycle events. SHIPPING COST NOT INCLUDED. PLEASE CONTACT US FOR SHIPPING COST.